Not all of the IL Indoor winners have been posted yet, so I’ll just include the ones here that have. My choice is listed first, followed by the winner in brackets. Goaltender of the Year hasn’t been announced yet but I’ll say here that when doing my IL Indoor picks, I changed my mind and voted for Dillon Ward (sorry Nick). I’m now… well, not exactly regretting that decision since Ward did have a great season but if I were to submit my picks now, I think I’d stick with Rosey (sorry Dillon). But there are a couple of other awards that weren’t included in either list, so I wanted to cover them here. Teddy Jenner. I mean no disrespect to the recent winners of this award, all of whom are deserving, but I’ve had Teddy as my Borrelli pick for several years now. Given how much he does for lacrosse every year, I’m kind of surprised he hasn’t won this. He is an all-around sports guy for sure (from hockey to basketball to rugby – huddy huddy, whatever that means), but clearly lacrosse is his passion. He does colour for various TV broadcasts, he’s been doing his Off the Crossebar podcast for several years, he writes for IL Indoor (and his 30 Second Shot Clock articles this past season were awesome – insightful thoughts from his many-times concussed head), he had a lacrosse radio show (also called Off the Crossebar) in Vancouver for a couple of years, he was the on-floor host of the Stealth when they were in Washington, and he’s active on twitter. Did I miss anything? Probably. He clearly knows the NLL but he’s just as knowledgeable (if not more) about the WLA, MSL, MLL, NCAA, as well as senior, intermediate, and junior A, B, C, and any other letters there are. He knows the game as well as anyone and loves to talk about it, and we love to hear him talk about it. Full disclosure: I’ve never actually met the man in person but we’ve been Twitter-buds for a few years. Then again, Teddy’s Twitter-buds with everyone. He interviewed me on his radio show once, and I interviewed him for this blog a few years ago. Honourable mention: Paul Tutka. Given his year-long twitter rant about how to improve the NLL (which came down to “change everything but the game itself, and even change some of that”), it’s unlikely that the league will honour him again, but three-time Borrelli winner Tutka is still one of the most knowledgeable lacrosse writers around. He wrote a preview of the 2016 Champion’s Cup series which is about as in-depth as any article you will ever see. I read stuff like that and think “WTF am *I* doing writing about lacrosse? I don’t have a hope of covering things to that level of detail.” The old adage about “he’s forgotten more about lacrosse than I’ll ever know” has never been more apt. But I’ve decided that I cater to a different audience. I’m going for the “I want to read articles written by someone who doesn’t know anywhere near as much about lacrosse as Paul Tutka” demographic. And I’m killing it, thankyouverymuch. I guess more full disclosure: The Money Ballers column that I’ve been writing on IL Indoor for the past five seasons was created and written by Tutka for the previous five seasons. Again, though, I’ve never met him personally. Lee Genier, Saskatchewan Rush. The lowest attended game in Saskatoon this year was their second game, when they had 8,624 come out. Again, that’s the lowest attendance this year. The Edmonton Rush only had three regular season games higher than that in the previous six seasons. They went from 7th in the league in average home attendance to 3rd in one year. Saskatchewan averaged 11,737 per game, an average higher than every Edmonton Rush season – in fact the Edmonton team only had four games higher than that ever. One of those four was a Championship game and another was $1 ticket night. 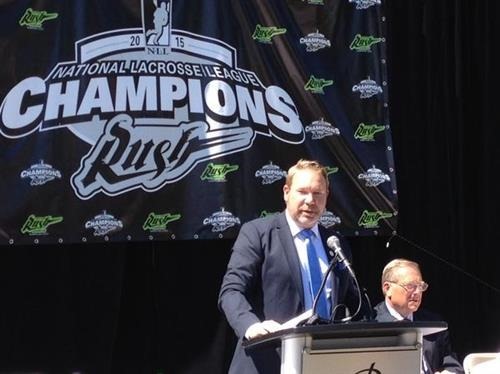 We certainly can’t give all the credit for the success of the team in Saskatchewan to Mr. Genier, the President of the Rush, but there’s no question that he’s been instrumental. The Rush didn’t have the crazy theme nights they had in Edmonton, when they put Twitter handles on their jerseys and brought in wrestlers and GSP (who, it turns out, is not me despite those being my initials) and the Dallas Cowboy cheerleaders and other celebrities. Not that these were bad ideas, but if you’re filling your arena based solely on the lacrosse team, those extras just aren’t necessary. They even held a rally on a Friday afternoon (not a game day) and got a thousand people out. Can you see that happening in Edmonton? Now, Edmonton averaged over 10,000 per game in their first two seasons, and then it started to drop off until it was down in the mid-6,000’s by 2015. Could that happen here too? Sure it could. But the first season of the Saskatchewan Rush has been an unqualified success, regardless of how the team does in the finals. Honestly, I have no way to know if Mr. Genier himself is the architect of the plan that brought in the big crowds. Maybe the award should go to owner Bruce Urban, or the entire Rush marketing team, or someone else. 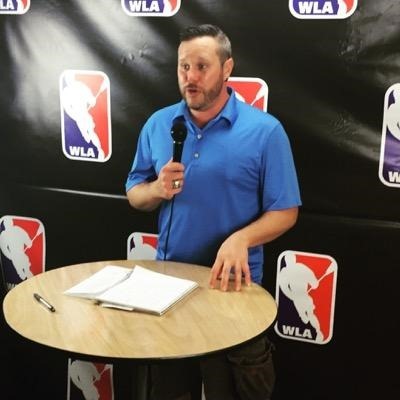 But Genier is one of the more public NLL team Presidents, popping up on social media and doing radio and TV interviews and such. The way that Saskatoon has embraced the Rush is partially due to lacrosse being an exciting sport and partially due to their team being the defending champs and one with a very good chance of repeating. But getting the word out to the public and getting the local businesses and politicians involved takes significant work and Genier and his team have done an outstanding job. If they don’t want to put two Stealth players on the list, the third would be John LaFontaine from Saskatchewan. It’s not really much of a prediction, it’s just the non-goaltenders with the most games and lowest penalty minutes. None of these guys picked up a single penalty in 2016. McLaughlin and Small played 18 games, Cornwall 15, and LaFontaine 13. This entry was posted in Opinion, Predictions. Bookmark the permalink.